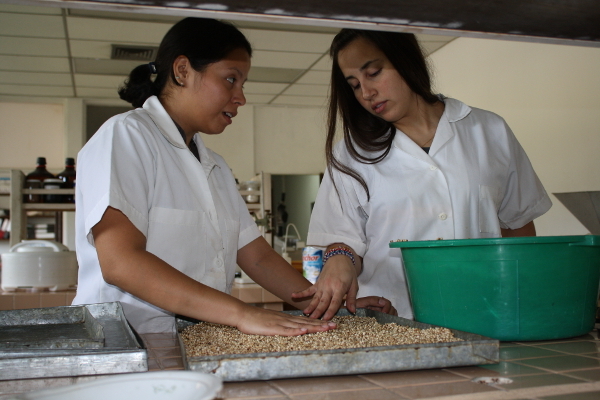 Volunteer Eliana Pinilla (right) and a CENTA technician test the best quantity of sorghum flour to mix with wheat for artisan bakeries countrywide. In 2005, Blanca Perdomo and 38 others started Las Bromas Cooperative in El Salvador to diversify agricultural production as a way to increase income and improve their lives. Like many women in her community, Blanca used to be a full-time housewife, taking care of her house and children while also helping her husband on the farm — growing corn, sorghum and beans for the family’s own food and income. Blanca and other cooperative members received technical assistance and training from two U.S. Agency for International Development-funded programs: the John Ogonowski and Doug Bereuter Farmer-to-Farmer (F2F) program and the International Sorghum and Millet Collaborative Research Support Program, working alongside the Centro Nacional de Tecnología Agropecuaria y Forestal (National Center for Agricultural and Forestry Technology, or CENTA). As a result, Blanca is now equipped with strategies to increase her income and contribute to improved nutrition and food security for the wider community. Previously, Blanca was selling her sorghum crops for $0.25 a pound for animal feed. She was surprised to learn from F2F that sorghum could also be a good source of income and nutrients if processed appropriately for human consumption. Blanca and other farmers received technical assistance from volunteer Eliana Pinilla on sorghum for human consumption. They learned how to prepare sorghum flour and explored different uses of sorghum in baked goods and traditional Salvadoran drinks to create new products to sell in the community. Today, Blanca earns $0.75 per pound for her sorghum crops, and Las Bromas Cooperative is one of many groups in the country using sorghum to make sweet breads, tortillas and beverages with high nutritional value (due to the zinc and iron in the sorghum). The volunteer assistance benefited approximately 200 rural families that have increased their income by approximately 50 percent in the past year (from $1,750 to $2,625). “Before, I could not earn any income; now, I am able to bring money for my family and pay for my children’s education,” Blanca said. The new products have been well accepted, especially by children, which has not escaped the attention of public schools in several communities. In fact, the Ministry of Education plans to include these products as healthy snacks for students in 2013.